EVERY SECOND FILM I SEE THESE DAYS SEEMS TO BE ABOUT THE TENUOUS RELATIONSHIP BETWEEN FATHERS AND SONS. I DON’T KNOW IF IT’S JUST BECAUSE I’VE RECENTLY GIVEN BIRTH TO A BOY AND I’M BEING DRAWN IN UNCONSCIOUSLY, BUT IN RECENT MONTHS I’VE CAUGHT THE ROAD, LAST RIDE, AND NOW THE BOYS ARE BACK, A DRAMA ABOUT AN ENGLISH SPORTS WRITER JOE (CLIVE OWEN), LIVING IN AUSTRALIA WITH HIS SIX-YEAR-OLD SON, STRUGGLING WITH FATHERHOOD AFTER THE DEATH OF HIS SECOND WIFE. It’s taken 12 years for Scott Hicks to return to work here after the enormous success of Shine. In the meantime he’s been flirting with Hollywood—making Snow Falling on Cedars, Hearts in Atlantis and No Reservations—before embarking on the Emmy-nominated documentary, Glass: A Portrait of Philip in Twelve Parts. At a recent Q+A in Sydney with Sydney Film Festival director Clare Stewart, where he introduced the film, Hicks spoke of being reinvigorated in his passion for filmmaking after working on the documentary and, when sent the screenplay of The Boys Are Back, he realised that he’d never seen such an honest exploration of father-son relations on screen; the truth of the dialogue struck him most. 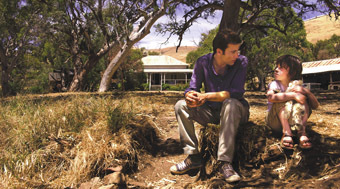 Based on a memoir (originally set in New Zealand) the script was transplanted to Queensland and then set on the beautiful coast of South Australia (at times it looks like a tourism ad), with the landscape and characterisation once again captured elegantly by cinematographer Greig Fraser (who also worked on the outstanding Last Ride by Glendyn Ivin and Jane Campion’s soon to be released Bright Star). What The Road, Last Ride and The Boys Are Back all have in common is tour-de-force performances from the central young actors. Scott Hicks obviously has a talent for directing young people (along with seasoned performers like Geoffrey Rush). Six-year-old Nicholas McAnulty is a revelation as Artie, a passionate boy who loses his mother to illness. When his mother dies in bed next to Joe, his delivery of the line “Is mum dead yet?” with such apparent nonchalance hits the mark—he seems able to repress his emotions, just as a grieving boy would, unleashing them at unexpected moments. His exhilarating lust for life (riding on the bonnet of a 4WD as it zooms down the beach; jumping from a great height into a spa with his goggles on) grabs you from the beginning and helps propel the movie, saving it from some slow moments. It’s not often in film that the charisma of Clive Owen is upstaged. Hicks said that they cast a wide net for the role but McAnulty, along with a sweet expressive face, had ‘attitude’ and that’s what they needed. As his teenage brother Harry, George MacKay is also a standout, conveying all the complexities of being the older child trying to find his place in a new family, carrying the burden of his parents’ divorce. While Scott Hicks directs with a light touch, Clive Owen interrogates the character with typical intensity and much of the screenplay is beautifully convincing, there are wavering elements that don’t quite work. The dead mother reappears to Joe as a kind of guide at difficult moments with Artie, helping him cope. The audience, too, sees her in the flesh, before she disappears from Joe’s vision. While it’s true, as Hicks comments, that many who have lost partners often do claim to see them (after death) to talk things through, it’s hard to get this right on screen. Hicks acknowledges the difficulty, saying that he didn’t want any suggestion of a ghost and also cut back the scenes involving her quite extensively. But it still feels awkward when she appears, somehow detracting from the solidity of the surrounding performances, perhaps because we don’t really get to know her character because she dies early on, and there’s no real chemistry sustained between her and Owens. In the recent animated film Up (Pete Docter, Bob Peterson, Pixar, 2009), the old man Carl (voiced by Ed Asner) speaks to his dead wife Ellie too but in this instance it works, the film full of melancholy and pathos because he just speaks aloud; she’s no longer physically present but he believes she can hear him. One of the bonuses of this year’s Australian feature film viewing has been the chance to see established filmmakers (Hicks, Beresford, Kokkinos, Luhrmann, Connolly, Caesar) screening alongside exciting newcomers (Glendyn Ivin, Rachel Ward, Adam Elliot, Warwick Thornton). The industry, like Scott Hicks, finally seems reinvigorated and it’s been worth the wait. The Boys Are Back is yet another example of a finely tuned drama full of rich, memorable dialogue, spontaneous humour and convincingly restrained performance from Owen and the boys. The Boys are Back, director Scott Hicks, writer Allan Cubitt from the Simon Carr novel, producers Greg Brenman, Timothy White, performers Clive Owen, Laura Fraser, George MacKay, Emma Booth, Nicholas McAnulty, Julia Blake, Emma Lung, Erik Thompson, editor Scott Gray, production designer Melinda Doring, cinematographer Greig Fraser, original music Hal Lindes. Q+A with Scott Hicks and Clare Stewart, Palace Academy Twin, Sydney, Nov 8.